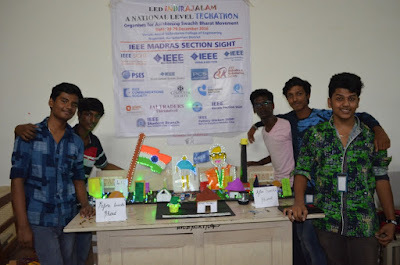 Annai Vailankanni College of Engineering in association with IEEE Sight, IEEE Madras Section and IEEE Kerala Section hosted “LED INDRAJALAM” - a National level Techathon Contest. The contest was held for a duration of 36 Hours starting from 8:00 am, December 28, 2016 to 8:00 pm, December 29, 2016. Nearly 150 people participated in this event. The theme of the event is Swach Bharat ( Clean India ). 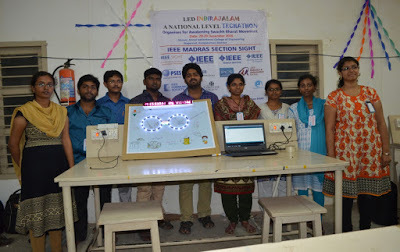 The teams exhibited their relentless spirit of hard work and innovation throughout 36 hours bringing out exemplary messages of cleanliness through LED display. Mr. J. Vincent Jain, Chairman IEEE Sight, Ms. C. Divya, Co-Chair IEEE Sight, Mr. Eugene Kingsley, AVCE staff and NCC members worked together to make this event a grand success. Jeppiaar Engineering college, Chennai, Tamilnadu. Sri Muthukumaran Institute of Technology, Chennai, Tamilnadu. Aishwarya college of Engineering and Technology, Erode, Tamilnadu. Trinity College of Engineering, Trivandrum, Kerala. Panimalar Institute of Technology, Chennai, Tamilnadu. Moderator Gnanadason Polytechnic College, Nagercoil, Tamilnadu. Cape Institute of Technology, Kanyakumari, Tamilnadu. 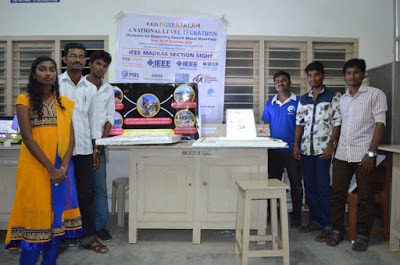 Annai Vailankanni College of Engineering, Kanyakumari, Tamilnadu.